Literary figures across the country have paid rich tributes to the great poetess Parveen Shakir for her literary services on her 56th birth anniversary today. 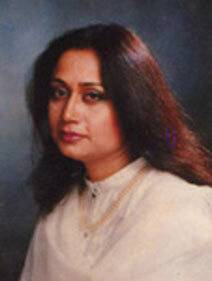 Parveen Shakir was born on 24th November, 1952 in Karachi. She was one of those female poets who could be regarded as pioneers in defying tradition by expressing the "female experience" in Urdu poetry. Renowned literary figure Iftikhar Arif while talking to a local news agency said Parveen Shakir was most prominent figure of literary circle who impressed the young lot through her thematic variety and realistic poetry. Parveen Shakir has skillfully portrayed complexities of life through her profound insight. Her poetic collection reflects the universal feelings of anger, happiness, pain and love, besides feminine perspective of love and the associated social problems, he said. Her published collection of works including Khushboo, Sad-barg, Khud Kalami, Inkar, Mah-e-Tamam are considered as most popular collections in literary history and admired by people, Iftikhar Arif said. Elaborating, Iftikhar Arif said that her poems reflect a simple yet deep lucidity that is generally associated with folk songs. However, her ghazals represent a combination of classical tradition with modern sensitivity. personification in musical way, she has introduced a broad concept of romanticism in her poetry, he said. Parveen Shakir has added a new dimension to the traditional theme of love by giving expression to her emotions in a simple and pellucid style and she has used variety of words to convey different thoughts with varying intensities using imaginative insight, Iftikhar Arif said. She has given the most beautiful female touch to Urdu poetry. Her poetry was a breath of fresh air in Urdu poetry. She used the first-person feminine pronoun, which is rarely used in Urdu poetry even by female poets, he said. Parveen Shakir's death was a major loss for the Urdu poets' community and fans. The literary pieces she left would be remembered for a long period of time, he said. Her first book `Khushboo' won the Adamjee Award. Later she was awarded the Pride of Performance. She got masters degrees in English literature and linguistics. She also held a Ph.D and another masters degree in Bank Administration. Parveen Shakir died in a car accident in Islamabad. Her death has deprived Urdu literature of an outstanding poet who has yet to reach the peak of her creativity.